I am so looking forward to Vegan Street Fair this upcoming Sunday, March 25th, 2018 in North Hollywood! I have been stalking the Vegan Street Fair Instagram since they started posting the vendors for the event a few months ago, and haven't stopped drooling over their photos! There are going to be so many delicious food vendors to enjoy this year, even more than in past years (if you are curious about past years or want a sneak peek at what you can look forward to, you can check out my past coverage for 2017, 2016, and 2015). I decided to put together a list of the top 10 vendors I was most excited about, though this list was extremely difficult to narrow down. 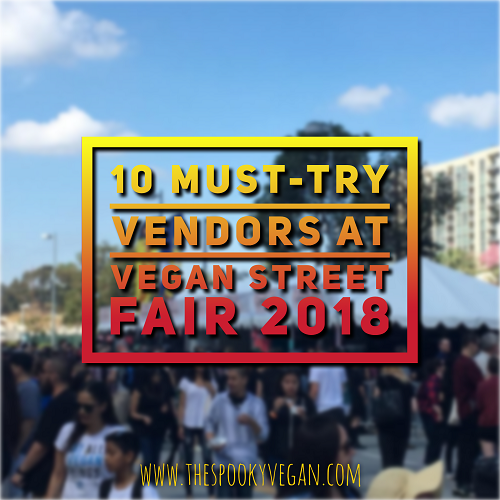 I'm thinking of this list as sort of a jumping off point for me of where to start when I arrive at Vegan Street Fair (I like planning ahead!). Note: as of this post the menus for each vendor have not been released yet, so the photos below from Instagram are just samples of what you can expect from these 10 vendors! 1.) Plant Alchemy - The Lai family creates wonderful small-batch plant-based cheeses, seitan, creamy sauces, vegan proteins, and more! I'm looking forward to trying their nachos and am planning to bring a cooler so I can take some of their vegan cheeses home! 2.) Monk's Meats - Hailing all the way from Brooklyn, I can't wait to try the vegan meats from this vegan butcher shop! I'm not sure what they will be serving, but whatever it is I can't wait to try it! 3.) Food Art by Lauren - The buzz on this vegan food truck has been strong, so I can't wait to try one of their beautiful dishes that incorporates healthy and colorful fruits and veggies that will infuse you with wellness from the inside-out! 4.) Cocobella Creamery - I haven't had the pleasure of visiting Cocabella's Creamery in Hollywood, so I am stoked they will be at Vegan Street Fair with some very exclusive specials of their vegan ice cream (like the magical cookie sandwich above made with pink crispy rice cereal! 5.) PBJ.LA - I've been drooling over PBJ.LA's creations and I can't wait to see what their vegan options will be at this event. I'm looking forward to some new twists on the classic PB and J. 6.) Vegatinos - Mmmmmm, can't wait to get some grub from these peeps! Hopefully they have something similar to the vegan birria shown above, because it looks amazing and I don't think I've ever had anything similar. 7.) Salteña Corner - This small vendor serves up Bolivian meat pies at local farmers' markets, and has added a vegan option to their line-up! I can't wait to try out their veggie-filled hand pies. 8.) Stoner Girl Treats and Eats - Ummmm I need this Rainbow Unicorn Waffle Ice Cream sandwich in my life!! Can't wait to see what other treats they have in store for us at VSF! 9.) Border Grill Restaurant - With locations in Vegan and Los Angeles, this restaurant by chefs and owners Mary Sue Milliken and Susan Feniger has some solid vegan options - and I can't wait for the opportunity to try some at Street Fair! 10.) Golden Clouds - How magical is this Indian sundae, made with rosewater, corn vermicelli, sprouted basil seeds, butterfly pea cardamom plant mylk topped with creamy rose sorbet, florals, and sliced almonds?! I can't wait to see what else this enchanting vegan eatery serves up! 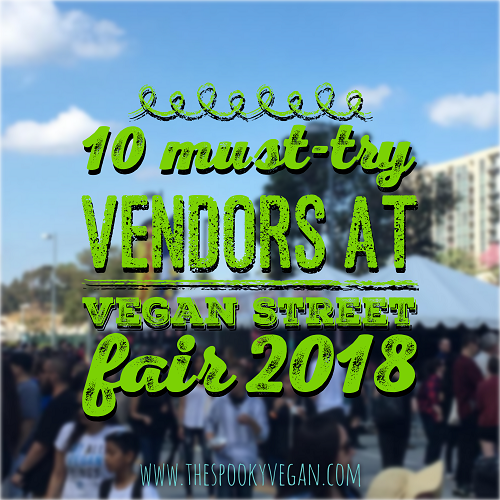 There are sooooo many more incredible vendors, from old favorites to new companies, that I can't wait to check out this Sunday at Vegan Street Fair! What are you excited to try at this year's Vegan Street Fair?! Hope to see you there this Sunday! If you want more info, check out the Vegan Street Fair site (which includes a map of the event), and Facebook event page!